Hazy, warm days, people outdoors working, playing, enjoying Michigan’s beautiful summer weather and our many lakes. Except for these poor friends and neighbors. Manure injection application from dragline on wheat stubble, NW corner of Posey Lk. Hwy. and Beecher Rd., Bean/Tiffin/Maumee watershed. Injection places liquid manure beneath the surface of the ground, close to the perforations in drain tiles buried under a field. Quicker access to the drain tile means that manure moves more quickly into ditches, streams, creeks, rivers. Think of it as “manure mainlining”. 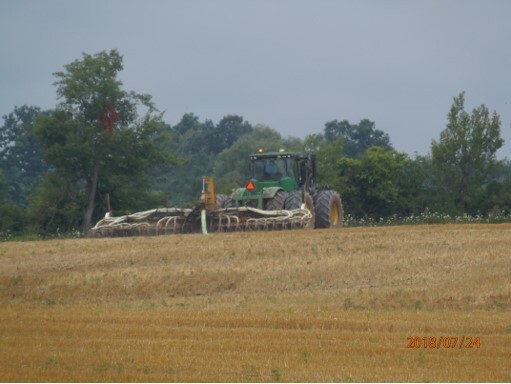 Drain tiles, mostly unmapped, are buried beneath 60% of the farm fields in the WLEB, and in our area it isn’t unusual to see 100 miles of drain tile buried beneath each one square mile of farm field. As much as 80% of the harmful-algae-bloom causing dissolved phosphorus is transported through drain tiles. The green hose behind the manure applicator is a dragline. 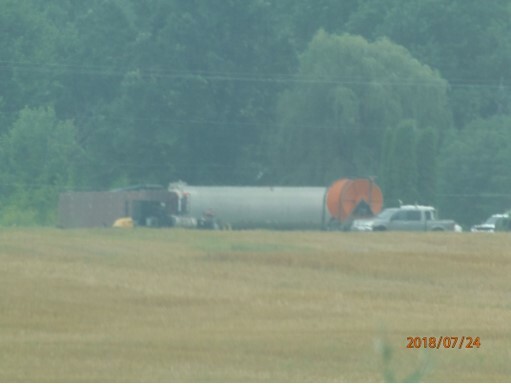 It snakes across the field back to the dump box, where it is fed by tanker after tanker hauling liquid manure. You can see the dump box (looks like a rail freight car) and a tanker unloading into it here. Does it stink? Yep. Untreated sewage is still untreated sewage. What crop is being fertilized here?